For my 30th birthday, I wanted to open something special. Naturally. While my wine collection consists of barely 20 bottles, I can reflect upon where and why I acquired each of them. In my opinion, this shows the quality of a collection. I may never have a 20,000+ bottle cellar, but I do have gems that are priceless to me. Of such was one 2008 Knights Bridge Cabernet Sauvignon. In 2012, I was working the floor one afternoon at Del Frisco’s. It was a Sunday but we were crushing it! I’d received a $50-bill-handshake, several tables were financially on board for magnums and I believe there was a 3-liter of Cain Five on table 50. We were rocking our previous 2011 numbers, so I took a moment to stop selling and enjoy the room. I’ve never seen a venue equal to that of my former employer, Del Frisco’s Double Eagle Steakhouse. Right on the waterfront in the Boston Seaport, no other steak house in Massachusetts could touch our numbers or service. The amount of money spent on raising up the pillars and glass walls was only matched by the exorbitant size of the checks signed each and every night. The dining room was one enormous entertaining stage; dinner and a show I always said. The hum of the guests, the bustle of the servers, the click of stilettos and the gaff-ah of buzzed businessmen created an unforgettable soundtrack. And it was on a night such as this when I met Jim Bailey. “My name is Jim Bailey,” he stated and extended his hand. We shook out a greeting and got to talking about wines. Jim told me he made wine. To be frank, I heard this all the time. Everyone and their mother makes wine. Not everyone and their mother makes good wine! I faned interest until Jim told me where he made wine. That’s Sir Peter Michael. Yes, he has been knighted. How befitting that he should have settled in Knights Valley and revolutionized the AVA which shares territory between Napa and Sonoma. Peter Michael is a titan in the world of wine. After starting his vineyards in 1982, he quickly rose to the top of his class by crafting some of the most coveted wine in Sonoma before venturing over the Mayacamas to Napa. Peter Michael spares no expense creating his wines and bottles sit on wine lists between $330-$500 a pop. He practices biodynamic and sustainable farming; hand crafting in my opinion some of the most memorable Bordeaux style blends. Name dropping typically doesn’t impress me, but this caught me off guard. Also: You can’t just BUY property in Knights Valley. It’s beyond expensive and as allocated as DRC. It’s something you’re essentially born into like royalty. Jim went on to talk about his Cabernet Sauvignon project and how he’d been working the AVA since 2006. While I’ve never been to Sonoma, I distinctly remember a photo in my Jancis Robinson wine book which shows a glorious photo of Knights Valley. There’s this massive tree, hanging heavy with age and from the moss grasping the branches. The tree is in the forefront of the photo but behind it is a large vineyard, bathed in the sunlight. The tree is lit up with sunbeams shining through the long, dangling branches and the trunk is knotted and craggy. For me, this was Knights Valley. For me, this was where Jim kept his grounds: Knights Bridge Winery. “I happen to have two bottles here for you,” he reached into his business bag and brought out two dark bottles with pristine medieval labels. 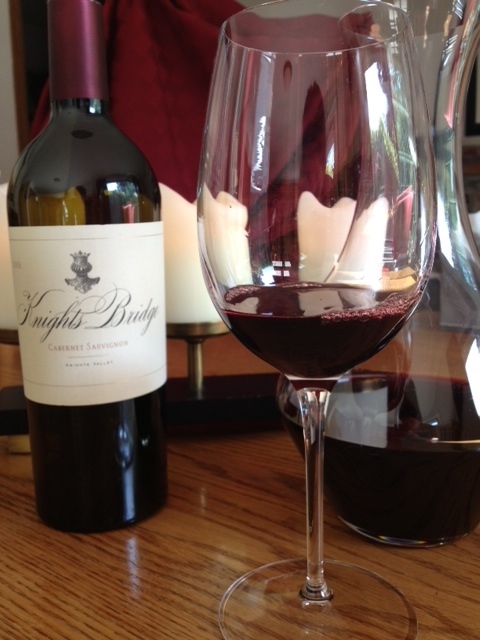 I stared at the gift: 2008 Knights Bridge To Kalon Cabernet and the 2008 Knight Valley Cabernet. “Thank you so much, I’m not familiar with Knights Bridge,” I admitted. Jim and I spoke about this wine project he and his business partner, Tim Carl, had started in ’06 and cultivated over the years with sustainable means. Both men were Harvard legends who caught the wine bug hard. And one of them was sitting at table 62. I brought the wine onto my Del Frisco’s wine list immediately from one of my distributors, Carolina Fine Wines through Martignetti. This was what wine was all about: Relationships. Who walks into a steakhouse to eat dinner and makes a placement? It was serendipitous. Jim Bailey became my friend. He invited me to the release of the 2009 Knights Bridge, complete with the new vintage of Chardonnay and their Pont du Chevalier Sauvignon Blanc. Jim’s house was like a chateau in the middle of Cambridge, MA. 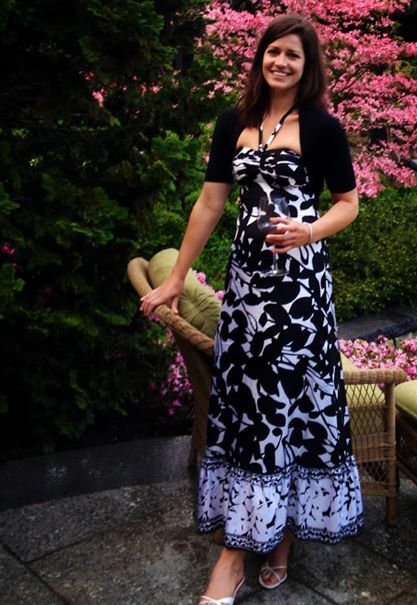 The grounds were groomed to perfection with a reflection pool in the middle of the yard, surrounded by tables of wine, gorgeous flower beds and lavishly dressed guests. Further into the yard, stood a massive gold statue of some Greek deity. The entire event took my breath away. I was in love with Knights Bridge. I left Del Frisco’s and joined Martignetti – I started selling Jim’s wine in a different manner, but still with a proud smile on my face. I apologized to no one for the price. If you had to ask how much it was…. well. The wines performed for me at accounts like Cirace’s in the North End and I received another invitation to the vintage release of Knights Bridge. The 2010 vintage party out did the 2009 party – being on the Bailey grounds made me feel like I was a part of something so much more incredible than simply selling grapes and water. I was proud of his wine; I was proud to have them in my portfolio. It made me remember why I loved wine. So I turned 30 this year while living in Seattle. I moved back to my birth state about two months ago with a job and my family waiting. At first, I had reasoned to turn 29 again since my last birthday was very difficult for a mirage of reasons. However, since I’ve been home, I’ve started seeing someone and I feel hopeful and happy again. I wanted to pop open something special to commemorate my birth year. While I pondered over my small collection, my eyes fell to the 2008 Knights Bridge and I remembered Jim Bailey. I remembered being happy at work and venturing over to introduce myself to table 62. I remembered him giving me the two bottles and hearing about his amazing winery. I remembered feeling like royalty at his vintage parties and I remembered selling the wine table side and then to accounts with Martignetti. Just looking at the bottle made me feel happy all over again. So I selected the 2008 Knights Bridge for my birthday dinner. And I was once again, happy. You are currently browsing the Lersif blog archives for June, 2014.